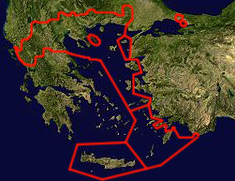 The Church of Greece is one of the fourteen autocephalous churches of the Orthodox Christian communion, whose territory consists of the whole of Greece except for those parts which belong to the Patriarchate of Constantinople, such as the Dodecanese and Crete. Though bishops of the "new lands" (those that were liberated from 1912 and afterward) are members of the Holy Synod of the Church of Greece, they commemorate the Patriarch of Constantinople in the divine services. Though it is also called the Greek Orthodox Church this reference is not restricted to the Church of Greece since it is also used by some of the Churches and Archbishoprics under the Patriarchate of Constantinople around the world. The current primate of the Church of Greece is His Beatitude Ieronymos II (Liapis), Archbishop of Athens and All Greece. The first contact of the Greeks with Christ is related by the author of the Fourth Gospel. He writes that some Greeks among those who used to visit Jerusalem at the Passover approached Philip and Andrew and asked to see Jesus (Jn. 12.20-24). The Greeks, as seekers after truth, were eager to listen to something novel, to meet the new master. Jesus was aware that the Greeks who came to Him were men with a searching mind and a troubled spirit. Upon His confrontation with them, He exclaimed, "The hour has come for the son of man to be glorified" (Jn. 12.23). These Greeks were few in number, but Christ saw in them not only Greeks but Romans and Scythians and other peoples of all times and places who would also seek to find Him. Jesus said the hour had come for the Christian Gospel to be proclaimed outside the limited boundaries of ancient Israel. This page was last edited on February 22, 2015, at 13:28. This page has been accessed 167,613 times.